The police will be able to respond more quickly if you use the online reporting facility on this website. However, if you do not want to report online, you can download and print the Self Reporting Form below. As well as a general reporting form, an Easy Read version are available. The form has been designed for you to report any form of hate incident or crime that you may have been the victim of, witnessed, or are reporting on behalf of someone else. 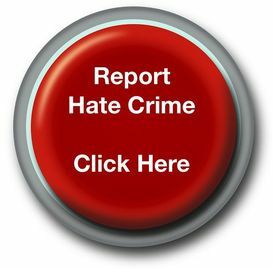 You can report all types of hate crime, including criminal damage, assault, verbal abuse and harassment. Once completed, the forms can either be handed in at your local police station or posted to your local police force. Details on how to contact your local police force can be found at www.police.uk (opens in new window). The Self Reporting Form is available in a number of other languages, available on the Downloads section of this website. This form is also being developed in a number of other languages and these will be added to the website shortly.